Earn $1.16 in VIP credit (116 points)What's This? 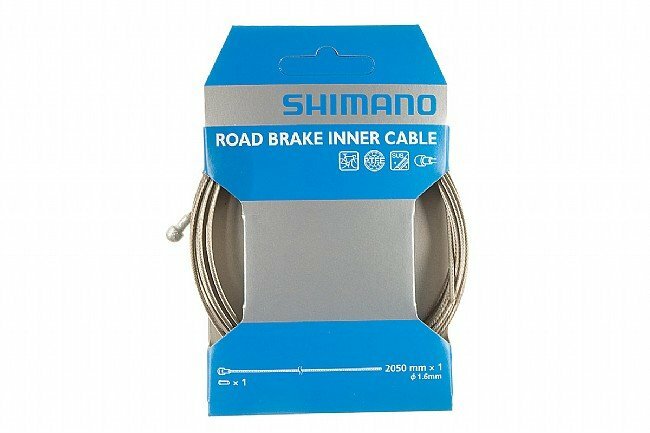 Stainless steel inner brake cable for use with Shimano/SRAM style road brake levers. PTFE coating for maximum friction reduction in all weather conditions. Includes ONE inner cable and end cap only. Does NOT include housing. 1.6mm diameter. 2050mm length. Note: This replaces the Dura-Ace branded inner brake cable as Shimano is no longer using the Dura-Ace branding for cables and housing. Instead the Dura-Ace level cables and housing are labelled as PTFE. I bought this to replace the Gore junk that came with my SRAM 22. First, the shifting cables went bad within 5 months then the brake cables went out within 10 months. I build my own bikes. They are well cared for, cleaned after each ride (mostly), and detailed every other week. Not sure how the original Gore cables could have lasted this short. I each case I have replaced it with the top of the line PTFE Shimano cable and the shifting and braking has been better than the OE that came with the SRAM. If you have ever dealt with the SRAM 22, you must know how finicky they are to setup. Once I switched to the Shimano PTFE cables, I finally was able to enjoy the benefits of the 22.